Xolo has launched new Omega smartphones in India. The smartphones are available in two different variants that are 5 inches and 5.5 inches. These Omega phones are powered by XOLO’s HIVE platform and octa- core Media Tek processor. The Omega 5.0 variant is available at a price of Rs. 8,999 while Omega 5.5 variant is available at a price of Rs. 9,999. The new Omega 5.5 variant will be available for sale in India from 10th December while the Omega 5.5 variant will be available for sale in India from 20th December. XOLO has aligned with Vodafone providing 500 MB free of cost data pack for Omega 5.0 variant and 1GB free of cost data pack for Omega 5.5 variant for a time period of 2 months. This offer can be availed for three months from the date of its launch. Let us now explore some features and specifications of these two variants. Omega is built with gleaming artistic design that gives it a mesmerizing look. The round edges and curved back makes it elegant. The curved edges with side keys facilitate convenience to the user. The 1.4 GHz Octa- Core processor enables uninterrupted and flawless multitasking features. This ensures exemplary performance and efficiency. These phones come with inbuilt HIVE platform and Android 4.4 version that takes your experience of using a smartphone to another level. Omega with HIVE support offers an ideal mix of software and hardware. XOLO Omega 5.0 variant comes with HD IPS display screen of 5 inches and 1280 X 720 pixels density. It comes with 1GB RAM, internal memory of 8GB with expandable memory up to 32GB. It is powered by MediaTek MT6592M 1.4 GHz octa- core processor. The dimensions of the phone are 144 X 72 X 10.5 mm. It has got EXMOR RS sensor and Bluetooth and Wi-Fi connectivity. It features a front camera of 2 MP and 8 MP rear view camera with flash (LED). XOLO Omega 5.5 comes with a HD IPS display screen of 5.5 inches and 1280 X 720 pixels density. It comes with 1GB RAM, internal memory of 8GB with microSD support. It is powered by 1.4 GHz octa- core MediaTek MT6592M processor. The Omega 5.5 also supports Dual SIM. 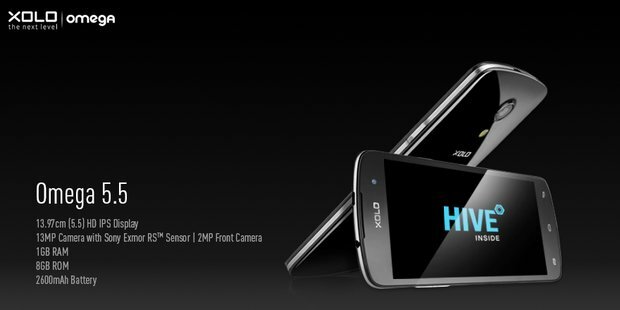 It features a front camera of 2 MP and 13 MP rear view camera with flash (LED). It has got EXMOR RS sensor and Wi-Fi and Bluetooth connectivity. The dimensions of the phone are 155.5 X 76.6 X 10.6 mm. These XOLO Omega phones comes with amazing features and specs that will attract the buyers. In addition, these phones can be availed at attractive and reasonable prices that are hard to resist. So, you can grab these smartphones after they are available for sale. I am sure they will not disappoint you. Top 5 Android Apps that Bring Out the WOWs!